Today is the “international day for drawing attention to women excelling in technology”. So, what’s Ada Lovelace Day about? Ada Lovelace was arguably the first computer programmer, condensing and expanding the notes for Charles Babbage’s analytical engine in the 1840s. Although it was Babbage’s design, Lovelace was the one who saw its potential. Although there are, perhaps predictably, plenty of people ready to argue she didn’t contribute all that much to the history of computing after all. 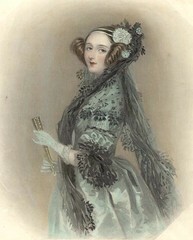 But the idea of Ada Lovelace Day is to profile modern-day women working in tech. Women have been involved in tech since the very beginning and, even though the profession is male-dominated, they are still working in tech now. Only a few days ago, Barbara Liskov became the second woman ever to win the prestigeous Turing award. She was also the first woman to get a PhD from a computer science department. Yet many efforts to address the issue of sexism in tech come across as token and patronising. I promised to take part months ago, but unfortunately I totally forgot to actually prepare anything specific. Obviously I use tech a lot – that’s what the feminist blogosphere is all about, after all. And it’s pretty crucial to my actual job, too. But what about women who are working in tech? For me, I was lucky to have a lot of techy role-models early on, including one of my aunts – she taught student-teachers, the vast majority of them women, how to use technology in the classroom. If you were in primary school in the UK in the ’80s, you might remember learning how to programme those turtle robots? That’s one of the things she worked on, and we had stacks of them in my house growing up. So, I’m going to leave this open: who are the women in tech in your life who’ve influenced you? Not a woman in tech per say, but my grandmother decided she was going to learn how to use a computer at 87, and she took lessons in a community class (she was by far the oldest pupil!). Now 92, she’s still rocking the IM messages, and I find it inspiring because she finds it so exciting. I hope that when I’m her age I will still have as much curiosity for new technologies. I’m currently studying in a batchelor or IT. In highschool I quit my IT course because I literally thought as a female I wasn’t logical enough to do it. (Yikes.) I moved into animation, then multimedia, which had a lot of programming courses; I felt I was actually more successful at programming than I was at my art related attempts. My biggest female rolemodel was a girl who was studying with me. She was/is fantastic, got high distingtions in most subjects. I was ashamed to ask the guys for help because I thought they’d see me as “That girl who needs help” (Even though I know most of the guys form their own support networks of other students to study with and ask questions with.) and I was able to talk to her, and she was brilliant. She’s moved on and is now getting her honors in IT. She wants to move up to a PHD. Also one of my programming lectures was taught by a woman who was admittedly not a brilliant lecturer but her _just being there_ was helpful t’me.